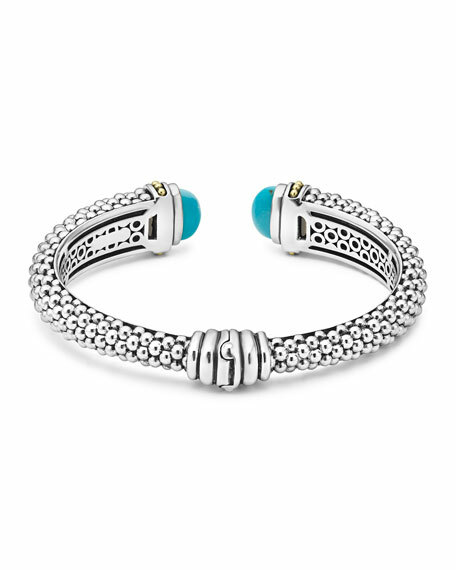 Expertly crafted Caviar beading with highly polished sterling silver stations comprise this innovative bracelet. 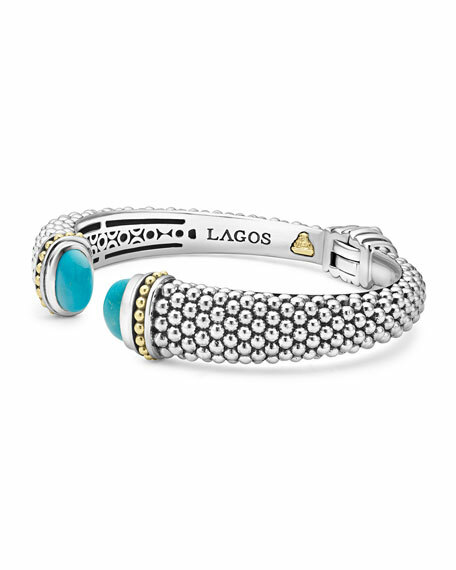 Lagos bracelet in sterling silver. Faceted blue topaz end caps. Alexis Bittar "Kinshasa" cuff bracelet. Signature hand-sculpted, hand-painted Lucite® acrylic. Golden-plated hardware. Pavé Swarovski® crystals. Hinged side with magnetic closure. Alexis Bittar "Kinshasa" cuff bracelet. Signature hand-sculpted, hand-painted Lucite® acrylic. Golden-plated hardware. Pavé Swarovski® crystals. Hinged side with magnetic closure. Approx. 1"H; 2.5"D. Made in the USA.